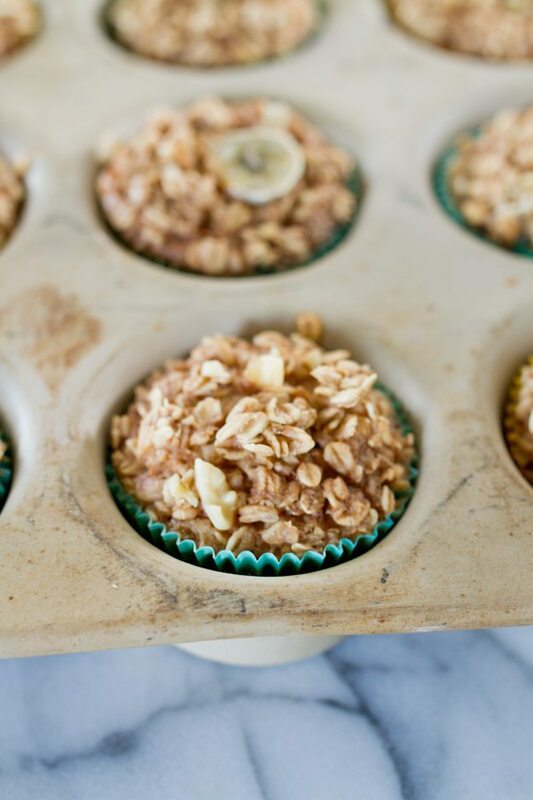 Take oatmeal on the go with these baked banana oatmeal cups! 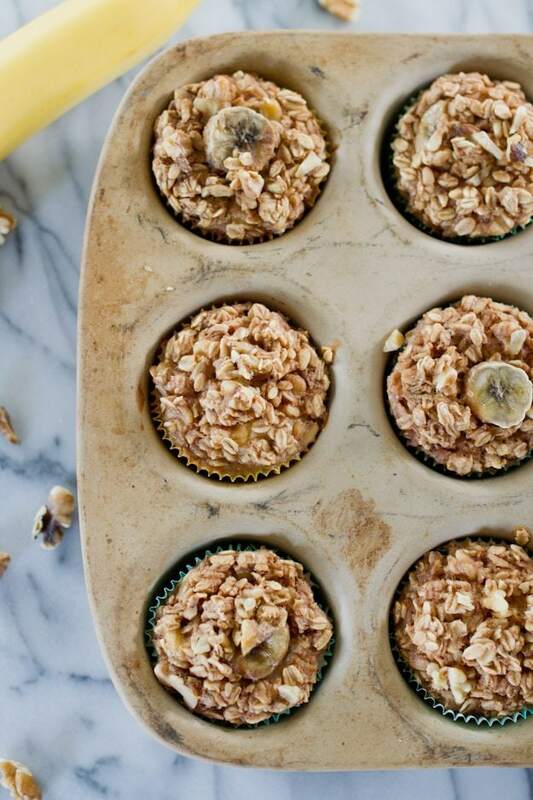 They taste like banana bread and make for a delicious, portable breakfast option. Make a batch on Sunday and you’ll have breakfast ready for the week. Anyhow, back to the point. Sometimes I’m in a huge rush in the morning because I’ve gone to the gym spent all morning reading blogs and I need something that I can grab and eat at my desk. 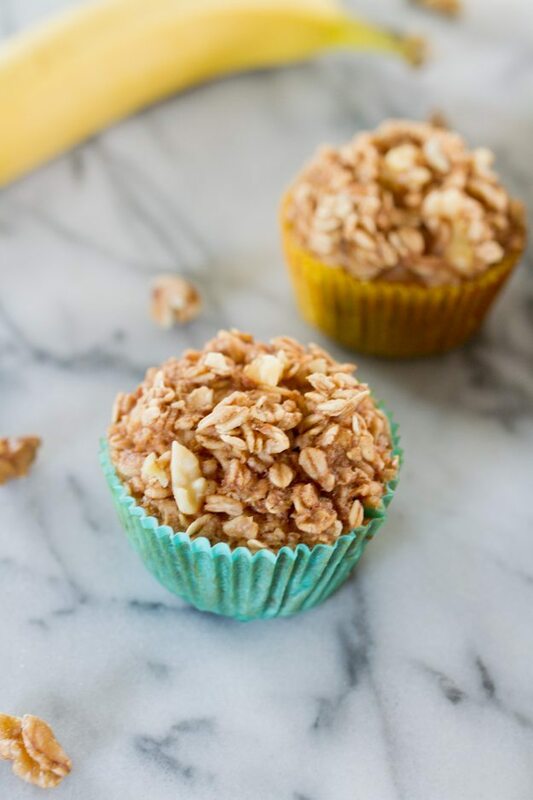 The recipe I’m sharing today is the perfect solution, especially for all you oatmeal fans out there — Baked Banana Oatmeal Cups! They look like muffins, but don’t let the shape fool you. They’re denser and chewier than muffins because there’s no flour involved. I tried one hot from the oven with a little almond butter and it was amazing! I’ve also eaten one at room temp and one straight from the fridge. They’re good at pretty much any temperature (IMO) but I think they’re best served warm. They taste just like a batch of chewy oats to me. Isaac doesn’t really eat oatmeal and he said that they remind him of kugel. I would have to agree with that as well. 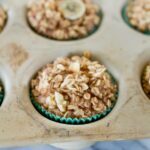 These baked oatmeal cups are just like oatmeal in the sense that you can add different mix-ins. I used bananas, raisins and walnuts but I’m sure they would be amazing with different fruits, nuts or even chocolate chips. 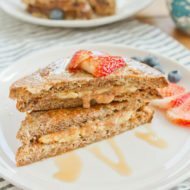 This recipe is dairy-free and can easily be made gluten-free by making sure all your ingredients are certified gluten-free. Preheat oven to 350 degrees and spray one 12-cup muffin pan with cooking spray or use cupcake liners. In a bowl, mix oats, salt, baking powder and cinnamon. In another large bowl, mix egg whites, vanilla, coconut oil, stevia and mashed bananas until combined. Dump dry ingredients into wet ingredients; mix well. Pour in almond milk and stir until combined. Gently stir in walnuts and raisins. Bake 30-35 minutes or until the center of each baked oatmeal cup is set and a toothpick comes out clean. Enjoy immediately or allow cups to cool and store them in the fridge or freezer. Reheat them in the toaster oven or microwave when you’re ready to eat them. When frozen take them out of the freezer and put them in the fridge the night before to thaw. Toast or microwave for a few seconds before eating in the morning. 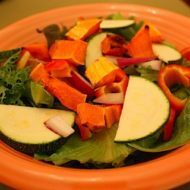 This recipe was developed for Almond Breeze and is now featured on the recipe section of their website! When they contacted me a couple weeks ago asking me to create a recipe, I immediately said yes because I use their almond milk daily and I absolutely love it. The unsweetened vanilla is my favorite and I already have quite a few recipes here on EBF that use it (chia pudding, overnight oats, almond banana berry smoothie, cinnamon oatmeal cookie smoothie, vegan no bake cookies, pumpkin protein bars, etc.). I had a hard time deciding what to make and almost went with muffins or a quick bread but I’m really happy I decided to go with the baked oatmeal because I had never had it before. Now that I know how delicious and easy it is, I’m sure I’ll be experimenting with different variations. I also noticed that almost all my recipes with almond milk are sweet so I think it’s about time I branched out and made something savory. I’m still brainstorming what I should make first. Any suggestions for savory recipes that use almond milk? Full disclosure: I was compensated by Blue Diamond Almond Breeze for developing the recipe in this post. I am the same way and need breakfast asap in the mornings no matter what. It also baffles me when people say they forgot to eat! I always think “what? !” haha. Great recipe, I will have to try them. I use almond milk to make frittata’s and scrambled eggs. Skipping meals in general baffles me. If I miss one I literally cannot function until I have food. I made something similar once and ate them crumbled over a scoop of Greek yogurt. Filling, easy, and quick. I’ll have to try your version! Totally right there with you! When people say they didn’t eat breakfast, I’m like, you’ve gotta be kidding me! All I think about is food, much less not eat a meal! It shows how different people are. Different metabolisms create different needs. Someone who is kind of slow in the morning, a very small, light breakfast works fine for them. Someone else who has higher energy in the morning a big breakfast high in protein will keep them more satisfied all day long. No matter what, skipping meals is not good. 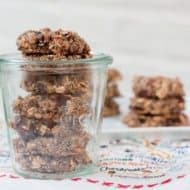 This recipe looks great and is a little similar to the home-made power bars I have in the oven! I made something similar to these a while ago. They were delicious! But I went a little overboard and ate them for more than just breakfast… I’ll definitely have to try these mix-ins! I love Almond Breeze too! I’ve never been a milk drinker, so almond milk is my favorite alternative! Almond Breeze is my milk of choice so this is perfecto 🙂 Thank you for the awesome recipe. I love almond milk and made something almost identical last night, only I made them in bar form and they mayyyy have had some shredded coconut in them 🙂 But I also ate mine warm with almond butter smeared on top….it’s the best way to eat any oat based meal! These look fantastic! Sometimes I really just don’t have time for a proper breakfast in the morning and having one of these to hand would be fantastic! I’m going to reply to myself here and suggest that I use almond butter instead of the bananas. I think that might work. Oooh man, I am so excited to make these this weekend. Thank you for the recipe Brittany! These look awesome. Might have to try them this weekend. I’m ready for breakfast as soon as I wake up to! Inevitably, my pup won’t let me do a thing until we’ve gone for a walk, and I like using that time to brainstorm a morning meal 🙂 Definitely thinking about this one tomorrow! Aren’t mashed bananas just the greatest thing? When I realized you could use them as a binder in baking and basically turn anything into a muffin, my life was instantly changed. I make something very similar to these, only in place of oatmeal I use Swiss muesli cereal. Yum! these sound absolutely amazing! cannot wait to try them. I made these over the weekend and they are so so yummy. Just ate 2 of them for my mid-morning snack at my desk at work and I am taking them on a roadtrip on Wednesday…and now I should get back to work. Just wanted to let you know I thought that they were delicious! Hi – I just finished making the batter, and it’s very “runny.” Is it supposed to be this way? I checked and double-checked the recipe, and I measured everything correctly. Is all this milk going to be absorbed or cook off? Well, I answered my own question 🙂 It did get absorbed, and the oatmeal cups are delicious. Very hearty. Thanks for the great recipe! I’m allergic to almonds, can i use regular milk instead? Regular milk or another non-dairy milk should work just fine! I’m just wondering why you don’t state the nutritional infoformation of your recipes?? Calories, Fat, Carb’s, Protein?, Sugar, etc…??? 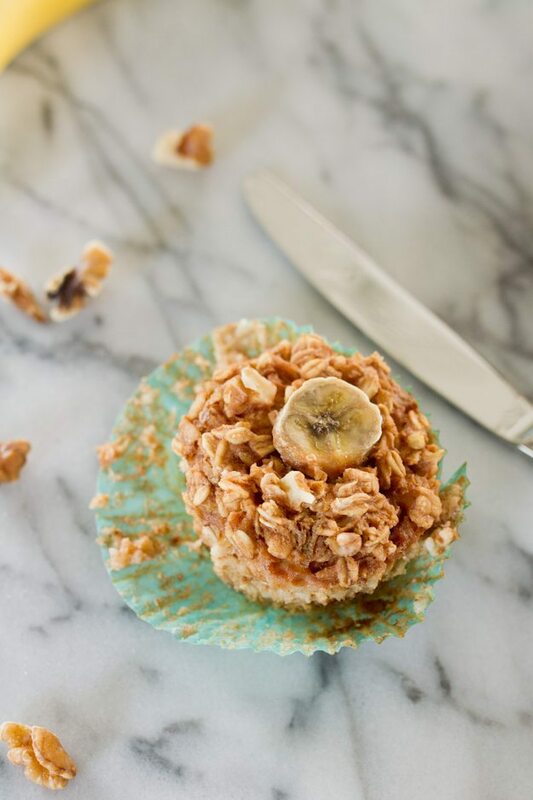 I was looking for banana muffins to make for my children and came across these. I just made them, and they are delicious. I did use regular milk, but I will try them almond milk next time because I do like it. Thanks for the recipe. I hope my kids like them as much as I do. I just pulled these out of the oven, and they smell amazing. My husband just tore himself away from his xbox to see what spelled so good! These look yummy. I don’t see the nutritional value on each serving. I am on a strict diet, and keep count of my calories, fat, sugar etc. Am I overlooking this information? I just made these over the weekend to have as snacks throughout my work week. I am absolutely in love with this recipe. I think next time I’m going to try chopped apple. I think that would be so yummy with the cinnamon and banana. Thanks for sharing! I can’t wait to try more of your recipes! Delish! I added one chopped apple & one pear.i also added a scoop of vanilla protein powder. So so good. Thanks! I would like to know how many calories are in each muffin. I am on l200 calories a day and would love to make these. I made these over the weekend for quick breakfasts during the week. I found then simple, filling and tastes quite similar to a bowl of hot oatmeal, but faster! Thanks!